Simplicity and elegance are found in the same form. 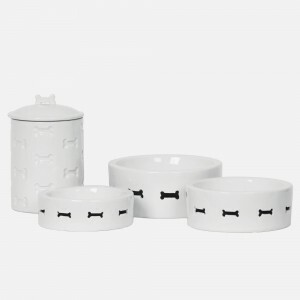 The Bone Appetit collection is made of porcelain and is featured in a pure white finish with a pierced bone motif. Choose from matching combination sets in 3 sizes - 2 small, 2 medium and 2 large. Why are we selling 2 of each in the same size ? 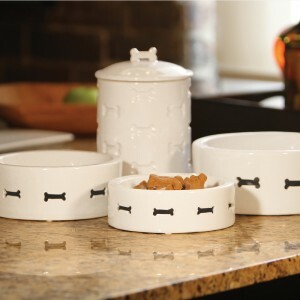 Perfect Match - 1 is for water and 1 is for food, depending on the size of your dog/cat. Porcelain bowls can either be placed in dishwasher or hand washed. 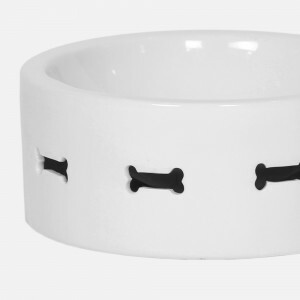 Holds up to 8 cups of dry food or 76 oz.